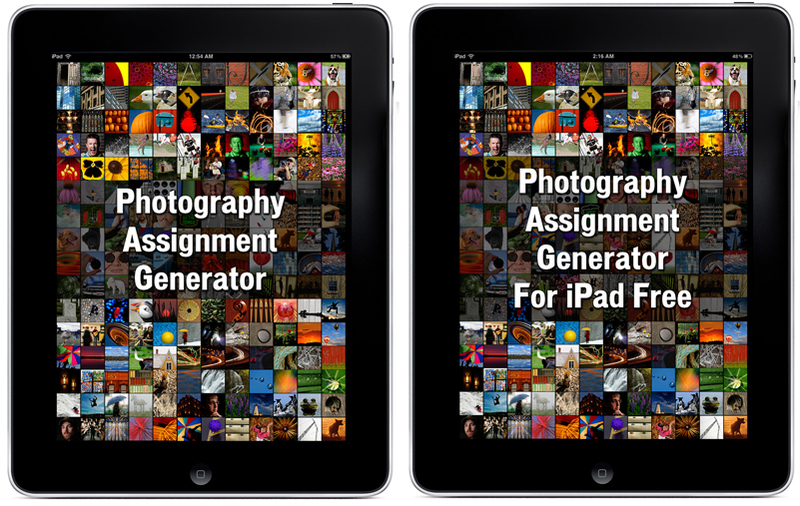 Photography Assignment Generator for iPad Now Available! I’m very excited to announce the launch of the iPad versions of the Photography Assignment Generator App for SLR Photographers! Here is all the info on the full and free versions, please share! Whether you are taking on a 365 day photo challenge or just looking for inspiration or ideas to expand your photography, these UNIQUE apps will be just perfect for you. While most apps on the app store let you DO things to the photographs you taken, like add text, borders, filters, or special effects, these apps are about ideas for TAKING photographs. OVER 100 INDIVIDUAL ASSIGNMENTS AND THOUSANDS OF POTENTIAL RANDOM ONES! Everything from camera settings, rules of composition, creative shooting techniques, photographing people, landscape and nature, and more subjects! Random objects and places, combined with techniques, environments, offer you hundreds of thousands of possibilities! The scavenger hunt assignment gives you lists of terms to find with your camera…with MILLIONS of possible combinations! You can choose from the list, or have the app give you one at random! The app is completely self-contained and does not require a wifi or network connection. No matter where you are, you can always get an assignment. NOTE: Due to the huge amount of content and beautiful images, both the free and full version of the app must be downloaded over wi-fi or through iTunes on your computer. As a firm believe that people should be able to try before they buy, there is also a FREE version of the full app that contains just a fraction of the assignments available in the full paid version…but should be enough to make you want it all! As a firm believe that people should be able to try before they buy, there is also a FREE version of the full app that contains just a fraction of the assignments available in the full paid version…but should be enough to make you want it all! It is from the full slr version, but the iPhotography version is basically the same , so it would work for both. OVER 75 INDIVIDUAL ASSIGNMENTS AND THOUSANDS OF POTENTIAL RANDOM ONES! Tailored to shooting with your iPhone/iPod, assignments range from the rules of composition, creative shooting techniques, photographing people, landscape and nature, and more subjects! Random objects and places, combined with techniques, environments, offer you hundreds of thousands of possibilities! The scavenger hunt assignment gives you lists of terms to find with your camera…with MILLIONS of possible combinations! You can choose from the list, or have the app give you one at random! Each assignment has a series of example images to demonstrate the technique or inspire you, with over 500 images in the app in total. The app is completely self-contained and does not require a wifi or network connection. No matter where you are, you can always get an assignment. NOTE: Due to the huge amount of content, the app must be downloaded over wi-fi or through iTunes on your computer. Development for Android has begun! Email me at noel@noelchenier.ca to be kept updated on it’s progress! -Don’t forget to rate and review the apps on the app store! As was the case with my first launch, I need your help to get these apps out there and up the lists. If I can get into the top 10 lists, it will be huge exposure! I will again be offering random prize draws to try to thank you for this help. I will be offering 5 $50 certificates towards courses. Even if you won last time, you name will go in again. If the app goes big, I will add some better prizes hopefully! -while I hope you all download the full version, even if you just download the FREE version it helps get the apps up the popular lists, and that’s what I need to be successful at this. -Please forward the info I sent you on the app to anyone else you think may be interested! Make sure to cc me on the email! -Post the info on any photographers forums, blogs, etc, that you take part in who may be interested. If you do, please send me a link so I can monitor for any questions/problems/feedback, etc. thank you everyone for helping me get closer to my dream of just doing what I love, teaching photography! ← How to photograph your Christmas tree…with or without your family!